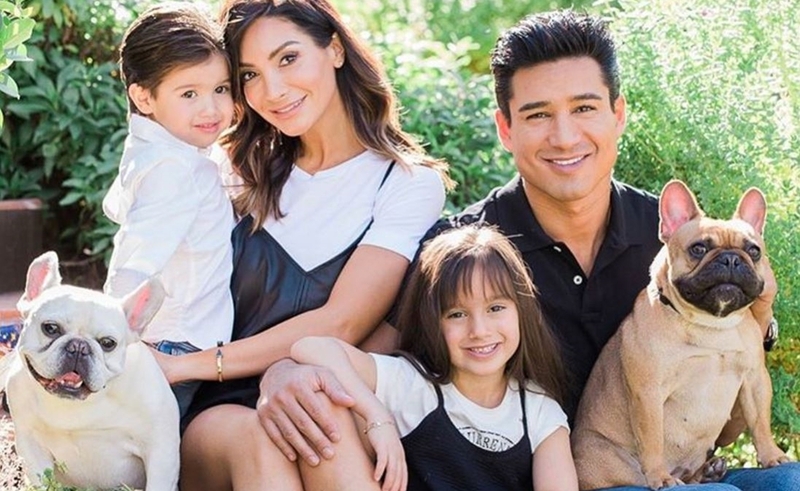 Mario Lopez Bio, Kids, Wife - Courtney Laine Mazza, Net Worth, Is He Gay? We have watched him grow on the big screen since the late 1980s. He made his onscreen debut in 1984 with a guest appearance in the television series Simon & Simon. However, Mario Lopez had been around for a while before then, appearing in a slew of local ads and commercials. Today, he is known as an established onscreen, stage, and voice actor, producer, and television host. The Hispanic American has hosted or co-hosted shows like Extra, America’s Best Dance Crew, The Dr. Oz Show, and the American adaptation of The X Factor alongside Khloé Kardashian. Mario has been in movies and series like Saved By the Bell: Hawaiian Style, The Bold and the Beautiful, Nip/Tuck, and Elena of Avalor. The California native was born on October 10, 1973, in San Diego. His father, Mario Sr. was employed at the municipality of National City in San Diego’s South Bay region, while his mother worked as a clerk in a telephone company. He also has a sister named Marissa who is married to former NFL player, Kailee Wong. Mario who was raised Catholic already had a very busy life by the time he was 3 years old. He seemed to excel in everything he was doing. Among other things, the child prodigy learned dancing in the genres of jazz and tap. By the time he was seven, he was taking karate, tumbling, and wrestling classes. He was a member of his high school’s wrestling team where he ranked second in San Diego’s amateur wrestler ranking and 7th overall in the state. The year 1991 marked his final academic session at Chula Vista High School in Chula Vista, California. After Mario Lopez was singled out by a talent agent in one of his dance performances at the age of 10, he opened his portfolio with appearances in many local adverts and commercials. Before he hit 11, he clinched his first television role in Simon & Simon. This was followed by a recurring role in ABC’s a.k.a. Pablo as Tomas Del Gato. His next gig saw him tap into his innate abilities as a dancer and drummer. He fulfilled these responsibilities in 18 episodes of Kids Incorporated. Three years on from his start with Kids Incorporated, Mario made a guest appearance in 1987’s situational comedy, The Golden Girls, playing the eponymously titled character Mario, a Latino boy who was facing the risk of deportation. His first role as A.C. Slater came in 1989 when he played the role in the movie Who Shrunk Saturday Morning? He would go on to reprise the role in a number of television series, movies, and voice roles. They include Saved by the Bell (1989 – 1992), Saved by the Bell: The College Years (1993 – 1994), Saved by the Bell: The New Class (1994 – 1996), and Robot Chicken (2008). In the later parts of the 1990s, he continued to conquer the big screen with showings in movies like Breaking the Surface: The Greg Louganis Story where he played the title character. In 1998, he played the police officer Bobby Cruz in USA Network’s action and crime drama Pacific Blue. He left the show after 44 episodes. Mario Lopez continued to make a slew of guest appearances in projects like Eve, Resurrection Blvd., The Bad Girl’s Guide, and Mind of Mencia. In 2006, Mario played the role of Dr. Christian Ramirez in 46 episodes of the popular soap opera, The Bold and the Beautiful. He was a doctor again, this time as Dr. Mike Hamoui on FX Network’s drama Nip/Tuck, albeit in a short-lived recurring role. Some of his voicing projects include The Smurfs 2 (2013), The Dog Who Saved Easter (2014), Dive Olly Dive and the Pirate Treasure (2014), and The Dog Who Saved Summer (2015). More recently, he has been on Nashville (2015 – 2016), NCIS; New Orleans (2016), Jane the Virgin (2018), This is Us (2018), and Elena of Avalor (2018). Mario Lopez was a contestant on Dancing with the Stars in 2006 with Karina Smirnoff. They ended as runners-up losing to the partnership of Emmitt Smith and Cheryl Burke. The actor has been on more talk shows and tv programmes than most of his contemporaries. His first television appearance as a host was in 1992 on NBC’s Name Your Adventure. Since 2007, he has been one of the hosts of the entertainment news show, Extra, and as of 2018, the actor has hosted over 1,400 episodes of the show. His hosting duties extends to MTV’s Top Pop Group, Masters of the Maze, Pet Star, The Wendy Williams Show, and Miss America. In 2012, Mario launched his own radio show, ON With Mario Lopez. The show aired on Premiere Radio and online on iHeartRadio. Lopez likes to live classy as evidenced by his $1.9 million 4-bedroom/6-bathroom property in California and his sporty cars. For someone who has appeared in a slew of lucrative movies, hosted money-spinning reality and talk shows, and done everything from Broadway appearances to writing books, it is understandable that he is worth quite a fortune. Various sources put his net worth at $16 million. According to the actor, he had a brief involvement with Fergie when he was a young teenager and she was about 10 years old. With her, he had his first kiss but what they had lasted only as long as their time on Kids Incorporated. Lopez’s first real relationship was with Ali Landry who is also an actress. They finally got hitched on April 24, 2004, in Puerto Vallarta, Mexico after dating for six years. Unfortunately, the marriage ended two weeks later after Landry discovered that Lopez had cheated on her during his bachelor party. Next, he dated Karina Smirnoff. The pro dancer was his dance partner while he was on Dancing with the Stars. They were together from sometime in 2006 and called it quits in June 2008. That same year, he met Courtney Laine Mazza, a Broadway dancer on the set of the Broadway musical, A Chorus Line. They clicked and started dating soon after. On December 1, 2012, Mario and Courtney walked to the altar. The two are parents to two beautiful kids, a son and a daughter. Mario Lopez and his family have their own reality television show titled Mario Lopez: Saved by the Baby. It premiered on November 1, 2010, on VH1. The actor is an open supporter of the LGBT community. Although a devout Catholic, he says he has no problem reconciling his faith with his pro-LGBT leanings. It is believed that he already had this stance as far back as 1997 when he played the San Diego hero Greg Louganis in Breaking the Surface: The Greg Louganis Story. Mario Lopez revealed that he was told it was a bad career move at the time. However, buoyed by the support of his immediate and extended family, a few of whom were gay, he went on to do the movie. He has repeatedly said that it was an honor playing Greg who was a real-life homosexual athlete. In 2015, the actor went a step further in his support for the LGBT community by leading the Miami Beach Gay Pride Parade on Ocean Drive. This further helped to widen his already large gay fan base. However, his relationship history proves that the actor is straight.